As with the South African anti-apartheid movement, the Bay Area has been historically a key center of solidarity for the Haitian democratic popular movement. The visit by Dr. Narcisse provided a rare opportunity to hear directly from one of its leaders about the situation on the ground in Haiti. As protests to the recent fraudulent elections meet with increasing repression, including an assassination attempt on former President Aristide on March 20, these times demand solidarity. Dr. Narcisse has a long history with the popular movement for democracy in Haiti. As a student, she served as secretary in her medical students’ association, a militant opponent of the dictator Jean-Claude Duvalier. At great personal risk, she demonstrated against the first coup against Aristide in 1991, then joined the staff of the second Aristide administration in 2000. She had to flee for her life after the second coup in 2004, but returned to lead the reorganization of the party, which she now serves as the national coordinator of the Executive Committee. Dr. Narcisse became the Fanmi Lavalas candidate for president in two elections contaminated by corruption. Massive daily street demonstrations protesting fraudulent elections in 2015 forced a new election on Nov. 20, 2016. These demonstrations also forced the hated Obama-Hillary Clinton-imposed president, Michel Martelly, to leave office on schedule on Feb. 7, 2016, despite various maneuvers to attempt to extend his term. 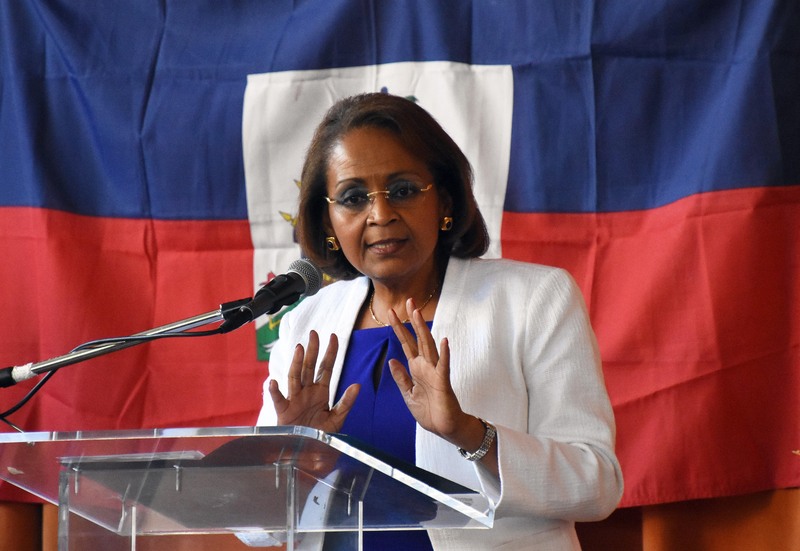 The Fanmi Lavalas party, long recognized as representing Haiti’s poor majority, organized a Dignity Caravan that toured the entire country throughout the campaign with Dr. Narcisse, often accompanied by President Aristide, attracting huge, enthusiastic crowds everywhere they went. Nevertheless, questionable polls announced the leading candidate to be Jovenel Moïse of Martelly’s PHTK Party. Clearly Haiti’s majority poor, who turned out by the thousands at Lavalas campaign rallies and demonstrations, were not consulted in the polling. Election day arrived, and it became obvious that a massive coordinated campaign of voter suppression and fraud had taken place. Voters needed an official Voter ID card, but many people never received them, so they couldn’t vote. The number of voting stations was significantly reduced, especially in rural areas, so people had to travel for miles with limited public transportation to try to vote. When they arrived, their names weren’t on the lists outside the polling places. Or if they were, their names weren’t on the lists inside the station. Other people were told to vote in cities far away. A countrywide electrical power outage one hour after the polls closed caused 2 hours of darkness as ballots were being transported and counted. Nevertheless, some people managed to vote, and sacks of ballots were later found uncounted and discarded. Dr. Narcisse became the Fanmi Lavalas candidate for president in two elections contaminated by corruption. The Electoral Council (CEP), composed of supporters of Martelly and of the coups that overthrew President Aristide, oversaw the elections. The Council announced that not only had Jovenel Moïse, the clone of Martelly, won an absolute majority of the vote – 55 percent – but he had finished first in Fanmi Lavalas party strongholds, including the very neighborhoods where many of the demonstrators lived. The international media promoted this fraud, reporting the announced election results as “official,” not even mentioning that the vote isn’t official until the contending parties are given the chance to appeal the results. The parties that were reported to have finished second, third and fourth in the vote DID appeal the results, in a so-called verification process. However first, the verifiers, including the three contesting political parties, were allowed far too little time to review each of the several sets of documents from each polling station. The fraud became so grossly blatant that in one small sample being verified, 85 percent of the votes for Jovenel Moïse were disqualified. In other samples, verifiers found numbers changed or added. By the third day of verification, CEP officials violated the electoral law Article 187 by changing the procedures so that the contesting parties could no longer participate in the verification but had to stand behind and merely watch. The three contesting parties and most observers left the room at this point, leaving three quarters of the election tally sheets not processed as required. It became clear that the CEP had no interest in true verification – their mission was to legitimize a pre-ordained electoral coup d’état. On Jan. 3, the CEP announced that Moïse had won the election. The fraud became so grossly blatant that in one small sample being verified, 85 percent of the votes for Jovenel Moïse were disqualified. Fanmi Lavalas issued a communique rejecting the fraudulent electoral results and calling on the people to mobilize against this massively orchestrated fraud. Street demonstrations continue daily, guided by the slogan “Nou Pap Obeyi,” WE WILL NOT OBEY! Dr. Narcisse has been at the forefront of these demonstrations protesting the announced election results, as U.S.-U.N. trained and supervised Haitian police brutally attack demonstrators with stinging tear gas, blue foam water cannons, bullets, batons and rifle butts. Two small demonstrations by Moïse supporters, however, proceeded without any repression. On Feb. 7, Jovenel Moïse became Haiti’s president despite the fraud and corruption. Few people attended the inauguration, and videos showed the march route virtually empty of spectators. Meanwhile, police and U.N. troops viciously prevented demonstrations in front of the National Palace. Fanmi Lavalas issued a communiqué rejecting the fraudulent electoral results and calling on the people to mobilize against this massively orchestrated fraud. On Feb. 8, Fanmi Lavalas held a press conference. Dr. Narcisse said, “The Haitian people did not accomplish Feb. 7, 1986 [the overthrow of the dictator Jean-Claude “Baby Doc” Duvalier], to end up in this situation today … The political organization Fanmi Lavalas … rejects this electoral coup d’état that resulted from an organized plot by the Provisional Electoral Council (CEP/KEP). Meanwhile, Moïse has announced his administration will build more prisons and support a law to limit press freedom, which particularly threatens independent community media, including Radio Timoun and Tele Timoun, the youth radio and and television stations housed at the Aristide Foundation for Democracy. On March 20, uniformed police officers fired on a vehicle carrying Aristide and Dr. Narcisse, resulting in a number of wounded, as tens of thousands of demonstrators marched beside them to protect them. No Haitian governmental or international official has denounced this assassination attempt as of this writing. The process of re-imposing and consolidating a renewed Duvalierist dictatorship marches forward, under the U.S.-U.N. occupation that began with the 2004 coup d’état.